If you’re floundering around looking for a topic for your masters thesis in literature, allow me to submit for your consideration corporate media for children on GMO’s, a fascinating and understudied emerging genre. 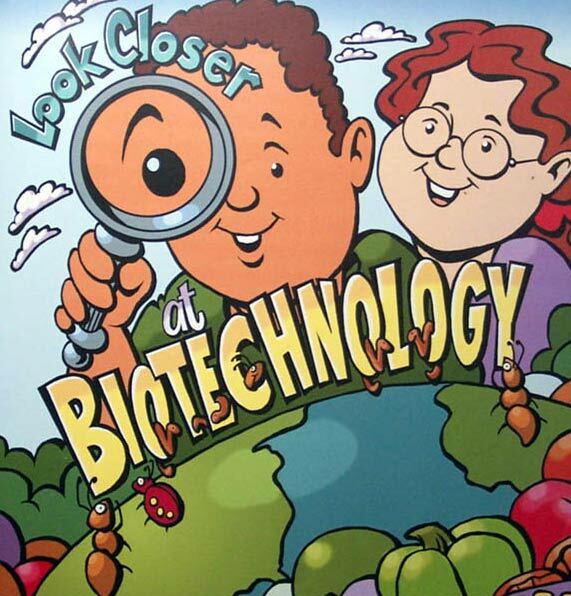 I was first introduced to this genre by the CBI* 2000 classic, Closer Look at Biotechnology, in which two obese nerdy tweens get a heaping helping of neo-malthusianism as bugs crawl happily on the word “biotechnology,” showing that it is safe. Along the way they learn to pronounce “by-o-tek-nawl-a-gee,” do fun word games, and learn that farmers who grew Bt cotton “were able to reduce the amount of insecticide used by more than 2 million pounds,” which was certainly the sort of thing I wondered about as a 10-year old. But Closer Look looks almost like a comic book beside the recently published Mandy and Fanny: The Future of Sustainable Agriculture, a towering, can’t-put-it-down achievement in the field. Appearing in the “India” section of the ISAAA website, M&F is a much more complex and challenging work, filled with bitterness and triumph, irony and humanity, sexuality and morality. I laughed, I cried. a tarted-up cotton boll who wears no pants and has a wild bush of green pubic hair. M&F is already been made into a major motion picture in which the Waxman Joker Corncob seems to have been voiced by Borat (“verry nayce”). In the rousing climactic scene, the coquettish pantless female boll enflames a group of leering peasants with the cryptic come-on “We are conspicuous by our absence,” leading instantly to a group act that would make any Bollywood fan blush. *CBI = Council for Biotechnology Information. Want to read more about what they say and why? See Science of the Gray or Both Sides Now. This entry was posted in Biotechnology, India. Bookmark the permalink.